Connecting with each other comes to us more easily now that we can just tap away on a keyboard and chat with a person who lives over 3000 miles away. Finding information knows no boundaries with Google on every computer in the world. As educators, this means access to more, faster, which is thrilling and mindboggling. However, it can also be frustrating and confusing with so much to choose from. How do you know which platform is the best for your goals? Which social media organization has the best resources and community? Which one would help you communicate better with your students? All of these questions flutter through our minds as our eyes wander through the gallons of information we search through. So, to simplify this daunting task for teachers, the following list consists of the best social media for teachers. A great site for connecting with other educators is edConnectr. It gives educators several avenues with which to find other like-minded educators. A Visual Mapping Engine narrows down certain criteria allowing educators to save valuable time and energy. Edmodo acts as a playground for teaching and learning with a place for posts, calendars, and general communication for teachers and students. Linking to students becomes simpler and more efficient as well as more effective when students enjoy the presentation of it. It makes it easy to share valuable apps with students. TedEd offers a variation of TED Talks with shorter, often-animated clips of subjects such as science, technology, social studies, literature, language, art, health, psychology, and business and economics. With communities and clubs, the site also makes it effortless for collaboration. Besides great graphics and themes, Google+ takes teachers to their students with circles that make managing virtual communication an art. Students might need to know more about a particular lesson because they didn’t quite get it the first time. Pull them into a circle of their own with just the right tools to connect them to their path to understanding and learning. The great part about Facebook is that everyone is on it. Students love connecting with their friends and family with Facebook so telling them to check out the page where you post only makes sense. However, it’s very important to stay professional and have a separate personal account. The best way to use Twitter for teaching is as a reminder to students that they need to complete an assignment for a particular due date or that they have an exam coming up soon so study this or that. Sometimes teachers even use it for inspiration by sending a famous quote. Students love Instagram for so many reasons but mainly for the photos and effects available to them. Teachers can create assignments that tap into the need to Instagram such as photo essays where students take photos, upload, and add captions or students can even create campaigns for certain organizations or just for a lesson. If you want to share videos on Facebook or Twitter, use Vimeo. But, there’s a whole lot more teachers can use it for such as uploading and storing video then utilizing it as a tool to teach students more about creating video. Vimeo teaches for you at Vimeo Video School with lessons and tutorials. With so many themes to choose from, WordPress has become a popular way for teachers to set up a web of communication and lessons with their students. Chalkboard is an educational theme that prepares students for learning and helps teachers outline goals and objectives while still providing great visuals. Teachers can also use it to inspire students to write more by having them create their own blogs and meet the WordPress Challenges. Like WordPress, Blogger connects teachers to students using unique themes as well as diary-style writing. With access to teachers’ posted links, lessons, and thoughts students become more successful and comfortable with the teacher when learning online. Using Skype means connecting with anyone, anywhere, at any time. This means students not only connect with teachers but teachers encourage students to broaden their view of the world. Set up virtual connections by contacting other teachers then connect the students to each other. Also, Skype has a whole portal dedicated to educators who can use it to teach various lessons already set up by the Skype team. The celebrated platform for pinning favorite pix can be a great teaching and learning tool. It also encourages quick collaboration between teachers on all sorts of subjects and interests. Teachers can set up a Pinterest page for one particular class or a series of classes with Pins that focus on themes or subtopics important to the lesson at hand. Educators of any level can click on the education category within YouTube and find several subcategories such as university, science, business, and engineering. YouTube even has a special section dedicated to teachers and how to teach with it. But, even if teachers never visited that section, they could teach using all the great videos available according to subjects or searches. If YouTube doesn’t make the cut, try TeacherTube. It’s dedicated to all sorts of education, from the basics to more complicated work. Interestingly, the tabs for docs and audio are some of the more useful resources within it. However, it’s the idea of TeacherTube and it’s tools that make it so useful because teachers can use it to communicate with students and there’s no question that this is within an educational format. For academics whose main goal is to share research papers, Academia.edu draws a crowd of over five million visitors. Academics can monitor the effect of their research and keep tabs on the research of the other academics that they follow. It’s a great tool for anyone needing data and information on various subjects and interests. While acting as a professional social forum for employers to connect with applicants or search for potential employees, LinkedIn is used for so much more than that. Having students post professional resumes there and then contacting them about the job market and the business world around them keeps them in touch with reality and the endless possibilities through a targeted education. Access millions of documents and hundreds of scientific news feeds by using LabRoots, a social networking site catering to scientists, engineers and technical professionals. Besides the plethora of information, it helps stay connected with colleagues and peers. Pulling students into the mix gives them a cutting edge feel and insight into precious tools and information. Ijad Madisch founded ResearchGate, which is similar to LabRoots bringing scientists together for collaboration. The difference really lies with the mission and the creators who are scientists working to give visibility to the dedicated researchers all over the world. Not a science lab, LabforCulture.org provides a place for artists to start blogs or an art group as well as connect and share information. Mostly made of Europeans, LabforCulture.org also highlights art news, events and exhibitions and helps artists find jobs and learn more about funding their projects. Teachers can use this for motivation and to help students get a feel for other artists’ work. Focusing on the gallery concept, CultureInside creates space for online galleries and actual galleries. It might just be an artist’s dream if used correctly. With the guidance of a teacher, students can profit from their creativity as well. There’s also a feature called lightbox, which connects artists and helps promote artwork in other artists’ lightboxes. GogoYoko began as a solution to the problem many musicians and artists have. They don’t make the money they deserve. Sharing and streaming music through GogoYoko keeps users listening and needing more, so teachers can use it to do the same. On top of that, GogoYoko helps musicians and artists sell and promote their music. If there’s concern about privacy, Sgrouples promotes itself as a networking site that allows users to have ultimate control over who belongs to what group. It’s supposed to reflect how we click together with our “small” group. More importantly, the site doesn’t share anyone’s information, so staying private really means anything shared, remains in that group. A French video sharing site, DailyMotion adds an edge to social media by presenting users with a “news” feed of the latest videos. 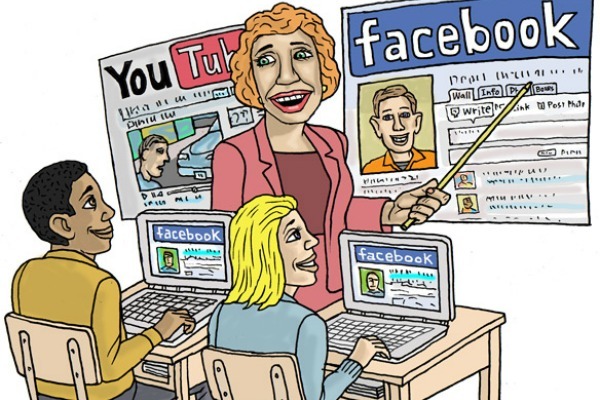 Teachers can use it for themselves in order to keep up-to-date on bizarre and informative social networking but also for posting their own videos or sharing some of the unique videos available through DailyMotion. The New York Times, Mashable, Wired, and Time magazine among others tout RebelMouse as the best tool for organizing all the social media networks any one individual uses. While also used by publishers or larger organizations, RebelMouse brings the many networks together for one person and creates a presence that fits a teacher’s agenda. Another powerful social networking manager, HootSuite makes it easier to access various forms of social media and analyze how valuable the use of one media is over another. Sometimes getting caught up in the social media craze can be overwhelming so using HootSuite helps make sense all the media at the same time. A great post, thanking you muchly! Google+ works well now as it’s linked up with YouTube – so you can post useful videos to one another, comment publicly, have private debates about it, and more. Which is very handy for easy discussions between varying videos. You can do the same on Facebook, of course, but I find Mark Zuckerberg’s site far too annoying. I left it earlier in the year. I can’t add anything else to this – a terrific list. Mercy buckets! thank you for your awesome list…. it was enjoyed to share this information. The is an interesting article. You have enlightened me on so many tools for education. I have really enjoyed information on this website. Very informative to students. I think these blog Information really helps for students. I have really enjoyed blog. Some of the nice tools have been listed. I have used couple of these tools it’s really helpful.